When making a case for your desired annual marketing budget, you might often feel like you’re shouting into a windstorm. That’s because in most companies, the first piece of the budget pie that gets cut is in the marketing department. The good news is that the winds are expected to die down in 2017, with reports indicating more dollars allocated your way—provided you can show the ROI to warrant getting what you want. What you measure ultimately will paint the picture of where investments should be made. It’s crucial to illustrate how well your current technology is tracking the entire life cycle of your buyers to ensure what you deliver makes them happy. When you put the focus on marketing’s contribution to revenue, you can better make the case for adding more fuel to the fire. Should you hire an outside agency, or more people? Replicate and scale, or try something different? You’ll want to have the numbers to back up your proposals—the more indicators you have that you’re cultivating lifetime customers, the greater chance you’ll score a budget bump. According to our recent benchmark of over 2000 B2B and B2C marketers, optics are still a challenge. Only 18 percent of marketers say they are able to track leads all the way through the funnel from opportunity to revenue. That’s a problem—one marketers need to solve going into 2017 and beyond if they want to break the budget claw-back cycles we’ve seen since 2008. Plain and simple, is $1 spent on this software driving at least $3 of value? Is this software critical in making decisions? If someone told you tomorrow you had to get rid of this software, would you stress out? You don’t need to replace your entire CRM system, but you should be looking for weak links to cut off or opportunities to make swaps. The goal should be an efficient, streamlined stack that everyone in the marketing department (and these days, both sales and marketing is becoming more common) is able to learn and use as effortlessly as possible. 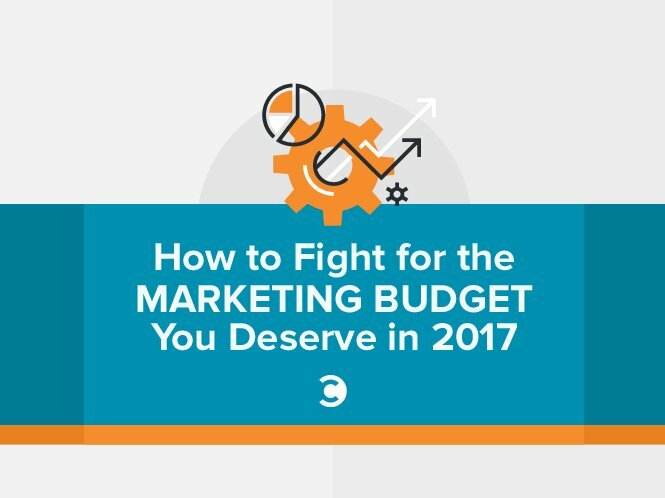 While technology is a necessary component of every marketing budget discussion, never lead with it when fighting for the budget you need. At the end of the day, more software isn’t going to solve your problems; having upwards of forty or fifty components to your tech stack is only going to get in the way of meaningful relationships with your prospects and customers—you know, the only thing that matters. Investments in marketing technology have skyrocketed, but the returns can’t help but diminish over time if that software isn’t implemented with a process and “people first” mentality and thus designed around getting the most out of your software. The parallel rise of Account-Based Marketing has compounded the reliance on automated programs—technology that, on its own, provides little value. Software can help your organization scale its marketing effort, but only if the proper investments are being made in people, so that you can squeeze the most juice out of the tech you already use. Your modern-day marketer doesn’t bring the necessary skills needed to perform their job at a peak level. And it’s not their fault—marketing has changed so dramatically in the past few years that education at the college or graduate level is stuck playing catch-up. As marketing and sales further overlap, marketers are taking on tasks they’re not accustomed to dealing with (chief among them, engaging with customers on a one-to-one basis). Any discussion of budget increases should start (and perhaps end) with education for your team. Marketing skills shouldn’t be defined by the tools that execute tactics. If you’ve never taken a people-centric approach to a budget pitch, you might be surprised at how far it gets you. Anyone can rattle off a list of new automation software and claim that it’s the fastest, best version yet. And while the money for it may come your way, you’re missing a golden opportunity to better equip your team to handle the challenges of modern marketing with the pieces you already have in place. Rather than assembling a laundry list of tools and campaigns, focus on what drove success in your most ROI-heavy initiatives. Work to assemble those success ingredients into an equation the business can see value in fostering. At the epicenter of any successful engagement process lies customization, and the biggest levers to pull in those processes are clean and abundant data, solid strategy, and bulletproof process. At the heart of each of those critical ingredients are talented people. Doing the work ahead of time to show successes attributed to marketing and demonstrate lifetime value of your customers allows you to tell a real story in your next budget meeting. Fight for the budget you deserve, and don’t feel like you have to propose drastic technology amendments if you’re on an upward trajectory. Your metrics will speak for themselves and tell the true story of where you need to double down.